Very grateful to Accent Press for coming up with lovely new covers for my ebooks…they also provided the fab promotional banner. My dear pal and hugely talented writer, Philip Casey, has come up with a ‘new look’ website for the new covers. I don’t quite know how he did it. Anytime I talk at any length with a computer expert I tend to resort to words like ‘thing’, ‘stuff’ and ‘what? It is really cold here this morning and I have the central heating on and the Dimplex and I don’t actually know how many layers of clothing. We had some snow last night but now it’s raining and I’ve brought a largish palm type plant in from the patio…it looks pleasantly tropical by the back door. When I was about eleven I made a ‘book’ cover for two stories I typed on my dear Dad’s typewriter…I could have done with some Tipp-Ex! (Dad was a clergyman and we were living in a lovely old rambling rectory in rural County Limerick at the time.) A self-published work with a print run of one copy, it was called ‘Stories For Everyone’ and featured a glamorous woman, a horse and a puppy on the cardboard cover (the pictures were cut out carefully) and the singer John Paul Jones on the back. One of the stories was about my beloved pony Merrylegs and the other was about the joys of nature, so it didn’t quite live up to its title! Though I still adore ponies and nature these days I have extended my subject-matter. For example women’s lives fascinate me and writing about them helps me to make sense of my own experiences. What’s more, I often make intriguing new ‘friends’ as I type and I love getting to know them more deeply. I greet them hoping that they will share their hopes and disappointments, their fears and dreams and perplexities. I love intimacy in ordinary life…people who seem to understand…people I don’t have to pretend with…and that’s what the characters in my novels ask of my friendship with them. They want to take off their masks and tell it how it truly is. Sometimes male characters do this too and I almost fall in love with them. For example I find Charlie in ‘Ordinary Miracles’ deeply fanciable. 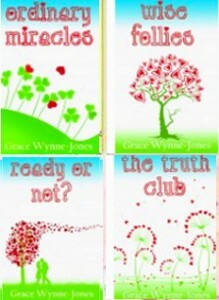 And Nathaniel in ‘The Truth Club’ would make a most wonderful confidant. One of my biggest pleasures is when a reader says they have felt understood by one of my novels. This is often because a character has admitted to feelings they themselves have never been able to share. For example a number of readers of ‘Ordinary Miracles’ told me they felt I had somehow been spying on their marriages. Jasmine, the main character, has just turned forty and reads books like ‘No Need To Panic: Courageous Acts Of Change In Women’s Lives’. Desperation eventually sends her on a quirky journey of self-discovery and there are tears and epiphanies and adventures and, importantly, laughter. I love writing humour. I like my novels to contain many notes and contrasts, like in music. But as the saying goes, certain chords always reach the heart in the same way. 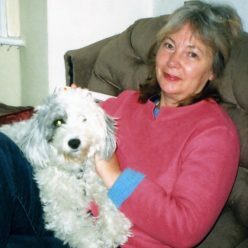 I love animals and they are also often important characters in my novels. For example ‘Ordinary Miracles’ features an adorable pig and ‘Wise Follies’ has a rather rude but impressive budgie and a cat and terrapins. ‘Ready Or Not?’ has a lovely Cocker Spaniel and ‘The Truth Club’ features a nice dog too! Peeked out the back window and noticed a bit of sunshine. Glad that I went swimming with a pal on Saturday. A local hotel was offering free promotional access to their spa. Didn’t actually want to go swimming on Saturday morning. It seemed far too wintry for it and I didn’t want the bother of packing up the stuff I needed to bring etc. It was uplifting when we got there though. I loved the steam room and sauna too. Cappuccinos and scones afterwards were also cheering.